There’s been no shortage of excitement at the Capitol this week, with the budget making its way through the Senate, funding for full-day Kindergarten being introduced, and much much more…there will be plenty of things to talk with legislators about at next week’s Public Education Funding Lobby Day! Public Education Funding Lobby Day is NEXT WEEK! **LAST CHANCE** Sign up to join other activists from across the state for the Public Education Funding Lobby Day on April 4! We’ll head to the Capitol, talk with your legislators, hear from seasoned advocates, and most importantly, make it clear to the legislature that funding our public schools should be a top priority! Notes: This is the first of the “permanent debrucing” bills that will refer a measure to the ballot asking voters to allow the state to keep TABOR refund money on years when there is a surplus for funding K-12, higher education and transportation. Notes: This is the second of the “permanent debrucing” bills that states that any voter-approved revenue that is brought in through the measure will be split evenly three ways between public education, higher education and roads, bridges and transit. A note on the “debrucing” bills: Debrucing is a critical first step toward creating more sane and sustainable fiscal policy in Colorado, and we’re grateful to House Speaker KC Becker for bringing this forward. Our goal is ensure that surplus dollars directed toward public schools by these bills will all add to – not replace – the dollars that the legislature otherwise would spend on K-12. We’ll keep you posted as things progress! An important note: It wasn’t smooth sailing for the Senate to pass the budget. A procedural move to require that the Long Bill be read in its entirety (it ain’t called the “Long Bill” for nothing) almost brought the Senate to a standstill. As a compromise, an amendment to the Long Bill passed through the Senate that appropriates an additional $106 million to transportation funding, with that funding to come from “all departments” of state government. This has the potential to take away from education funding. We will continue to monitor the bill and amendment and let you know if action is needed as the Long Bill makes its way through the House next week. This week we want to say a big THANK YOU! To Rep. Wilson for his work on education funding throughout his time in the legislature. Not only is he a prime sponsor for the bill to fund full-day Kindergarten, but he is constantly reminding his colleagues that every bit we are able to increase funding for public schools is good, but we must keep pushing. 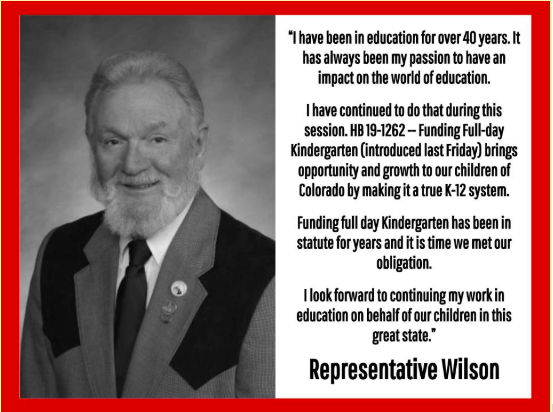 Thank you, Rep. Wison, for continuing to fight for our students and schools! No Replies to "And the late nights at the Capitol are just beginning..."